Picture a warm, humid day in July of 2020, and you hear the chant…TED…TED…TED, but it is from the Constitutionalist Conservatives inaugural convention, held in the state of Texas….And who are they chanting for? The chant is for the team of Ted Cruz and Carly Fiorina, as they stand on stage with their families, accepting the nomination for candidates for the 2020 general election. Red, White, and Blue balloons mystically falling slowly down, as pictures of the Constitution are flashing on huge mega screens around the convention. The power of the people and the rumble of the applause can be felt several blocks away. The American voter is tired of the same old politics of yesterday, where promises are made, lies are passed around like sticks of bubble gum, and the Constitution is torn apart piece by piece. They finally found what they were looking for. Two strong Constitutional candidates who put country and citizens before their own self-interest, and have offered the bright light of a better tomorrow by going back to the constitution. The C.O.S Chairman introduced Ted on stage earlier as the true American Constitutionalist. 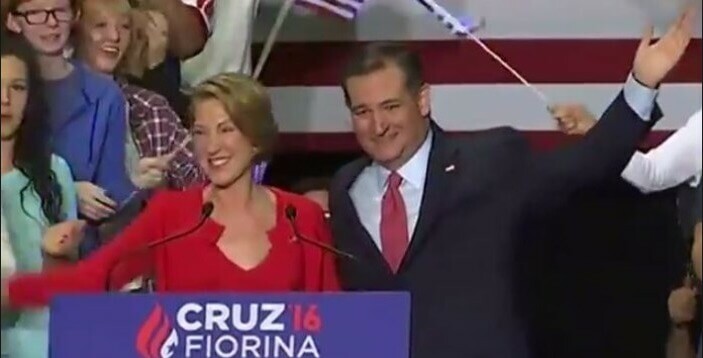 As Ted started speaking he stopped, and invited his running mate, Carly to come up and join him on stage to talk to every American, young or old, rich or poor, minority, or Caucasian, LGBT, or heterosexual, all people felt in their hearts, knew in their minds, America was on the cusp of a transformation back to the Constitution, where she could be the strongest force for Freedom to her citizens and to the world. As we watch the race today, and see a Democrat who has a 30 year history of criminal activities, or at a minimum, very questionable activities competing against a populist who has not one clue on how to bring unity to America, what the constitution states, or how to create a “Great America”. The story above will be more closely associated with the election of 2020, than what anyone today would fathom, but the time has come to bring the Constitution back to Politics, the classroom, and everyday life. The true Hero has been Ted Cruz throughout this election cycle. He has stood his ground on promises made to his constituents in Texas while looking forward to bringing his strong-willed legal counsel approach and debate style to the White House. While Chris Christie spent his days being a bully, until he found he was not the biggest bully in the playground, Ted wanted to debate issues. While Marco Rubio was talking about small hands, Ted wanted to discuss how to bring the Constitution back to the forefront of political discussions. While Jeb Bush was needing to protect his brother’s and father’s reputation from lies of Donald Trump, Ted was discussing God and country around the country to voters. Ted stood tall as others fell down to the level of arguing and trading insults. Ted would have no part in it. He had a message, and that message was Freedom, ordained by God, and reinforced by the Constitution. Ted had won many cases in state and Federal Supreme court concerning the constitutional rights of individuals’ and states. Ted made promises to his fellow Texans, and if it meant reading “Green Eggs and Ham” to his daughters while he stood firm on issues in Congress, or strong enough to accept the insults of his fellow Senators when he would not just go along to get along. Ted never gave up his principles, while still supporting the Republicans, and he never gave into his desire to attack back when his wife and father both were attacked viciously. Ted saw the path was a rocky road to fight Donald and then to go against Hillary. Ted decided he would step back, allow Donald to show his abilities, and then look again in 2020. But today, America needs a man of conviction, a knowledge of the Constitution, A conservative life, and fights back against the rich and powerful in Washington D.C. This man is truly Ted Cruz. His running mate, Carly Fiorina is as strong as he is, and this team would be the most amazing duo to not only fix the struggles of division in America, but to secure the borders properly, bring the Constitution back to Politics, the classroom, and everyday life. So though it takes guts to pull off what Cruz did, there wasn’t much downside politically. It seems unlikely that a Trump victory would mean an end to Cruz’s Senate career. If 2016 ends up being a disaster for his party — and it’s a good bet it will — Cruz will be the only major Republican to emerge from the Trump fiasco with his principles largely intact. Maybe, as his critics claim, he’s just laying the groundwork for 2020. Maybe it will backfire. Maybe only someone as stubborn and egotistical as Cruz could do it. So what? So now the time has come, do we stand tall and ask Ted to stand tall and take up the reign of the Constitutionalists, or do we allow a socialist, or populist to destroy more of our beloved Constitution? I want a man who can in the middle of a political battle, not only against the other party, but the aged elites of his party, still finds time to read a bedtime story to his children, and A man who can talk about the Constitution in an arena filled with followers, then stop long enough to smile and chat with a young male admirer. I want a man who is principled, knowledgeable, powerful enough to bring stability back to the White House, but loving enough to mourn the divisions in America. For me, the answer began in Texas, and that Texan is the only true Constitutionalist running, with his running mate, Carly Fiorina being the second most Constitutional. That is what I want, what do you want out of your POTUS? I want the Lionhearted……..